Let’s all spread a blanket on some fresh spring grass and read a book, shall we? Not sure what to read? Let’s see if I can help you with that. Not only am I recommending a few of my favorite recent reads (books with this season very much in mind), but I am GIVING AWAY FREE BOOKS. Do I have your attention? Read to the end for all the details. And, as always, remember that I use affiliate links in each new edition of These Farmhouse Bookshelves. You can find more information about that right here. Recently, my sister Kelli sent us this first book as a gift (yes, the same sister of photography fame). It’s a picture book, but it was pretty much my lifeline during those last few horribly brown pre-spring days. The kids love it, too. And Then It’s Spring (Booklist Editor’s Choice. Books for Youth (Awards)) by Julie Fogliano and illustrated by Erin Stead is a gorgeous, award-winning, treasure of a book. I recommend it for kids and for any big people in your life who love spring or gardening or quietly humorous storytelling. This is a far cry from captain-underpants and diary-of-a-wimpy-kid humor, but it had my own kids howling. And then breathing very quietly and asking questions about the seasons and how plants grow. So, pretty much a winner. I discovered this next writer, and her debut book, at the recent Festival of Faith and Writing at Calvin College in Grand Rapids, MI. This book may have been the very best thing about that festival (though I hesitate to quantify an experience that was full to overflowing with Very Good Things). Things That Are by Amy Leach is not like anything you have ever read. I promise you that. First, it is a beautiful book. Lovely to hold and with elegant, whimsical illustrations. A book-lover’s book. Second, the writing is startling. Every single word is surprising and unanticipated. Hilarious and wise. Leach makes me laugh out loud and reminds me of the power words have to stab me straight through the heart. This book is a marvel. What is it, exactly? It’s like a cross between a PBS nature documentary and Lewis Carroll. Except, so much better. So much wiser. Leach writes about nature – everything from panda bears and sea cucumbers to caterpillars and pea vines. She isn’t writing about people, except that she is. This is a book about the beautiful strangeness of our world and how much we can learn by taking a very close look at the creatures all around us. Things That Are stretches the English language to its most delightful limits. This is nature writing as poetry, and each essay deserves to be read out loud. Amy Leach sat right next to Fred Bahnson for one of my favorite panel presentations of the festival. I am also recommending his book Soil and Sacrament: A Spiritual Memoir of Food and Faith . If you enjoyed Barbara Kingsolver’s Animal, Vegetable, Miracle: A Year of Food Life then I’m sure you will appreciate Bahnson’s own memoir which explores the spiritual dimensions of the same subject (and if you haven’t read Kingsolver’s book please do go and rectify that). In Bahnson’s words, this book is written from the perspective of a “pilgrim” and an “immersion journalist.” He tells his own stories, but he tells the stories of many others around the world who have discovered the sacredness of the dirt under our feet. This is a diverse bunch. There are mushroom-cultivating monks, metal-head, ex-con coffee roasters, maiz-growers in Mexico and Honduras, Pentecostal farmers, and Jewish growers of organic vegetables. Gardeners and foodies will automatically appreciate this book, but I think it deserves a much wider audience. This book is also for all those interested in peacemaking and justice. Beyond even that, this is a book about our spiritual origins. As Bahnson describes so eloquently, one of humanity’s oldest stories tells us something about ourselves that remains vitally important: we are the Adam who was created from the adamah. We are humans made of humus. Our spiritual and physical lives depend on the soil too many of us find it easy to ignore and abuse. Now, on to the details you’ve been waiting for … free books. The first giveaway is straight from me to you. I want to say thank you for reading these book recommendation posts, for sharing your own recommendations with me, and for clicking on those amazon affiliate links! Also, I love Amy Leach’s book so much I want to share it with one of you. Leave a comment on this post, and you are automatically entered to win a copy. It will be very professional and unbiased and probably involve names in a hat. The second giveaway is courtesy of Moody Publishers and my fellow writer Hannah Anderson. I’ve appreciated Hannah’s contributions at Pick Your Portion (we are both regular contributors there), and she has just written an eloquent and important book. Conversations about women, the church, and identity tend to focus on roles or categories or accomplishments. I happen to think that those are very important topics of debate, and I love the books that shine new light on old conversations. But Anderson sets up camp somewhere else entirely, and we need that too. Made for More: An Invitation to Live in God’s Image explores a woman’s identity as first a person and an image bearer of a glorious God. This is an inspiring, encouraging, beautifully written book. Again, leave a comment on this post, and I’ll stick your name in the hat for a chance to win your own copy. I’ll leave comments open for a week. Leave your comment before Friday, May 9 at 11:59 pm. Always look forward to “These farmhouse bookshelves!” Have discovered so many new ones from you!! Putting all of these on my list, although my bedside stack is tempting gravity already! Love finding new authors to read. Thanks so much for the chance to win! Ooooh, I really really want to read the Amy Leach one. And Hannah Anderson is great as well! Having just come home from two weeks of perusing your bookshelves, I don’t even know where to start! Soil and Sacrament is high on the list and I already ordered Amy Leach’s work! Oh please enter me in the drawing! I so enjoy your book recommendations. This is why I like Facebook & following your mom & sister – they always post links to your lovely writings! Otherwise I would just be another stay at home mother living in a dark hole. Thank you! I’m going to share this post with a book loving friend! I want to be Amy Leach. Or my writerself wants to be her writerself. I didn’t make it to that session but am hoping to hear it in audio when that’s available. I did get to hear and meet Fred at the Arkansas Literary Festival last weekend. I love your Farmhouse Bookshelves posts. And I’ve heard that another method of scientific random selection is writing the names down on uniformly sized pieces of paper, tossing them on the carpet, and seeing which one the cat walks on first. You’d be amazed at a cat’s ability to walk daintily among a mine field of old business cards without touching one. So thankful for your blogs, which are written with words which express the gentleness of wisdom. I will be looking into some of these books simply because you write in a way that moves me to desire and yearn for more good in my life, so I would expect to find in most of the books you recommend the sort of thoughts that inspire such desires. Ooo, so great titles! Thanks for adding me to the contest! Oh this is delightful, My friend! Count me In. I’m always looking for fresh reads and you’ve delivered a bundle here. Thank you for sharing these riches. I always enjoy seeing what you are reading. I just finished Surprised by Motherhood by Lisa-Jo Baker and Spiritual Misfit by Michelle DeRusha. I know these have got to be fantastic if you’re suggesting them, so I’d love to have a copy to add to my own book collection! Always enjoy hearing your recommendations and being in a giveaway too 🙂 Hugs! Stumbled on your blog by chance and would love to get my hands on copies of these books! I want to read the one about identity. And the first one you spoke of. Our KS grands are coming the end of the month. Sounds perfect. You are so motivating, Christie. Always love reading your recommendations! Thank you so much for your recommendations and blog posts. I love your bookshelves- and aspire to read so many of the books you suggest. Always love a good read. 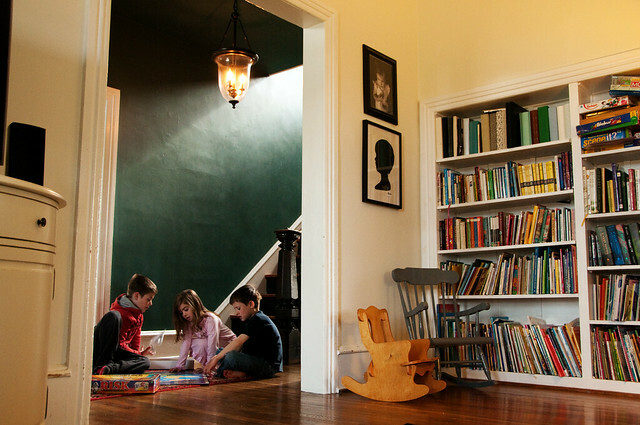 And your bookshelves – so inspiring. One can never have too many books. Thanks for the recommendations! These are wonderful recommendations – thank you so much! Thank you, thank you everyone. We have two winners! Jessica won a copy of Amy Leach’s book, and Rachel D. won a copy of Hannah Anderson’s Made For More. Congratulations! Winners have been notified by email. Let’s do this again some time, shall we?